The storefront will also offer back-catalogue titles that may be difficult to find in traditional retail outlets where the latest and greatest games tend to get the bulk of the shelf space. This lack of support for older games in bricks-and-mortar game stores has been one of several issues disrupting the relationship between game publishers and game sellers. Another major issue has been the increased retail emphasis on trade-ins and used games, which many developers and publishers see as directly affecting their business. The e-commerce site could strengthen the ties its fans have to Konami itself, and the publisher is likely to see an increase in interest from its core fanbase. 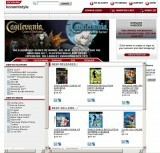 Whether or not KonamiStyle.com will significantly affect in-store sales of Konami games remains to be seen.